Ahly’s coach Patrice Carteron has said the loss of the CAF Champions League title is why he was stricter with his players ahead of the clash against Emirati team Al-Wasl in the Zayed Champions Cup Round 16 second leg on Thursday. “Losing the Champions League is a failure that we have to admit. We have no choice other than winning against Al-Wasl in order to make the fans happy and convince them that we are a good team who can compete and can get out of this stumble,” Carteron told Ahly TV late Wednesday. “The players accept it when I am sometimes harsh. I have to be strict to raise the player’s level of concentration,” the 59-year-old coach added. 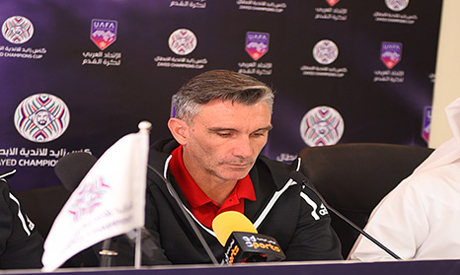 Carteron stressed that Al-Wasl game is just a start before turning to a very dense schedule in the domestic league. “I wish Al-Wasl game would be a return to winning,” he said. The French manager revealed that due to the absence of some players, the match is a chance to field new blood. “It is a chance for them to perform in a way that would satisfy the technical staff and me personally,” Carteron added.